Reflecting the essence of relaxed indoor/outdoor living in Boca Raton's prestigious beachside Estate Section, this sublime new modern estate is the collaboration of two noted South Florida firms – Signature Development Group and architect George Brewer, whose innovative works have been honored with numerous awards. Taking its cue from Mid-Century Modern design, this single-level residence is effortlessly styled with clean lines, generous glass, and lofty open-concept spaces in an airy courtyard plan that benefits from a profusion of natural light.The beautifully proportioned layout totals 5,444± square feet with four bedrooms, four and a-half baths, and a three-bay garage. Retractable 12±-foot-high glass doors make an open connection between the inside and outdoors where the garden terrace and lanais with a summer kitchen compose various lounge areas by the placid pool with sun shelf. Tropical foliage sets off the architecture in this prime setting just a short walk from the sugar-sand ocean beach and the legendary Boca Raton Resort & Club.A trickling water feature creates a calm sense at the elegantly architected entrance into the glass-walled foyer which overlooks the pool courtyard and has Italian porcelain tile floors that continue through the main living spaces. Brightened by window walls along the courtyard, the capacious great room's free-flowing living/dining areas combine with the showpiece kitchen outfitted with fine Italian-crafted Snaidero cabinetry and counters of Caesarstone and quartzite. For the master chef, the Miele appliances include a gas range.Stepping out by the pool from a private wing, the master suite indulges in a luxe double bath designed as a spa-like retreat, next to a boutique-style wardrobe room. Placed apart from the master quarters, three other bedroom suites include one which opens to the courtyard. 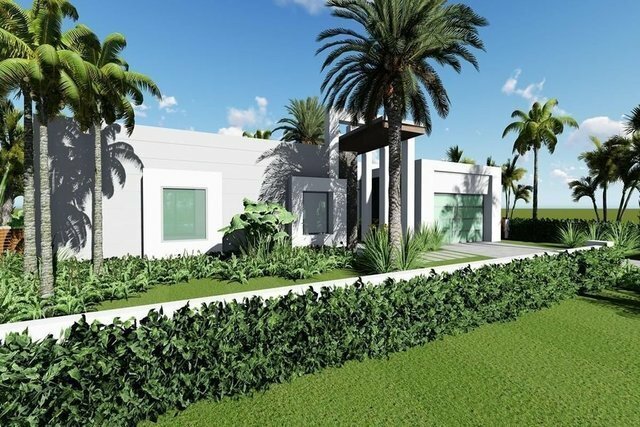 Scheduled for completion in early 2019, the home is attuned to comfort and ease with amenities including smart-house systems plus a full-house generator with natural gas service from the street. In a sought-after neighborhood considered Boca Raton's crown jewel, this timeless modern estate offers everything desired for effortless luxury living.